I love my pastries and will travel far and wide where ever I am to nibble on something really good (well, this applies to all food – but particularly for pastries). So it’s a shame that while I had been hearing about The Flaky Tart on Mount Pleasant for a while, I’ve just never gotten around to going. We knew we had good treats ahead of us the second we stepped in. My sister and I were greeted by that lovely baked-goods smell (not to be confused with pastry-smell), of cookies and pie. Encouraged by scent alone, we pretty much bought one (or more) of almost everything in the store. Of the cookies I tried, I liked the ginger ones best. I have yet to try the cranberry ones, so take that for what it’s worth. Cookies were just the tip of the ice(d) berg though! 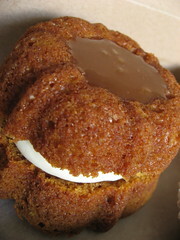 Lightly spiced with a lovely cream-cheese filling and yummy caramel to boot! Aside from the pie-pastry, the highlight of this trip was the pumpkin-caramel bundt cake that I snagged. This was a moist and just-spiced cake with a creamy hit from the cream cheese filling. Not to mention the lake of caramel that drained down from atop. Just wow. It’s been a while since I’ve liked a dessert that much. I still think about it every few days. Other baked goods under the fork was a day-old scone (really quite moist and good), day-old lemon pound cake (passable), a lemon tart (tasty enough), and a toffee brownie, (didn’t enjoy that much). To be fair, I find most chocolate desserts aren’t my thing. Gasp, I know, but there you have it. I prefer plain dark chocolate to many of the chocolate-laden desserts you find on most menus in the city. Shhh! Out of the oven - a beef and mushroom pie in a shell that eclipses the filling. Now, up for grabs are not only sweet treats but savoury ones too. Granted, I didn’t really look very hard, but I didn’t see a sign or any obvious display about it, so I just cut to the chase and asked what savoury pies they had for the day. There was a chicken and leek pie that I would have snagged, but was only available later in the afternoon. And so, I would just have to be appeased with the beef and mushroom. From their freezer to my oven it went (with a stop at Culinarium for apples and sausages), and then I understood what everyone was going on about. The pastry has to be the best I’ve had in Toronto in a long time. This pie indeed lived up to the Flaky Tart name – toasty and flaky and light. I’m not sure what lard they were using, but it really makes for a great crust. The filling was chunky and good. I find that by the last bite, not being overwhelmed with salt is a good thing – but you still might feel the filling was under-salted. After our lunch of pie (and cookies, a scone, Reisling-infused berkshire sausages and honey crisp apple), next up were the tarts. Eager to see if the crust would live up to that of the warmed savoury pie, we got right down to it. 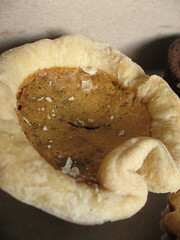 Between the pecan and butter tarts, I had to say the butter tart won my taste-test, despite the distracting raisins. The pecan tart was filled with nuts, which didn’t leave room for much filling, sadly. On both was again the fantastically good crust. Still good cold, but if you have the chance, warm it up in the oven and you shall be rewarded. Definitely worth a stop-by is Culinarium, just a few doors down. Interesting selection of local produce and product. 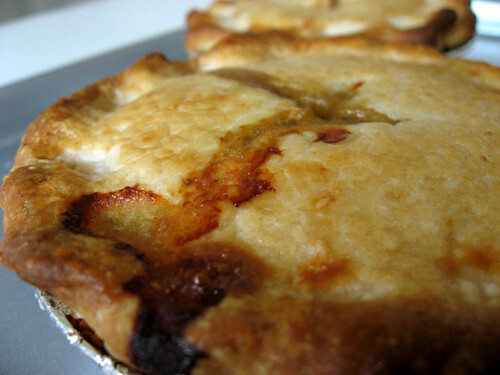 A tip: call ahead to Flaky Tart and get them to heat up a pie for you too! That way you don’t even have to wait to enjoy the crusty goodness – but bring your own fork!